This article originally appeared in the Fall 2017 issue of Paprika Southern. To see the full feature in print, plus fashion inspired by academia, a fall dessert buffet, dark and moody wedding inspiration, and much more, order your copy of the Fall 2017 issue of Paprika Southern today. Autumn calls for a shift in mood for our interiors, even if the Lowcountry is fickle to exhibit the crisp and cool weather ideal to the season. Including some cozy elements and fun mid-century touches, as well as accentuating existing items, can poise a home for all the activity to come. The fall season fosters entertaining at home. Adding simple and functional furnishings to spaces can make time hosting friends and family relaxed. Search out vintage items such as a Danish modern cabinet to double as storage for bar items and as a display surface for food and beverage presentation. 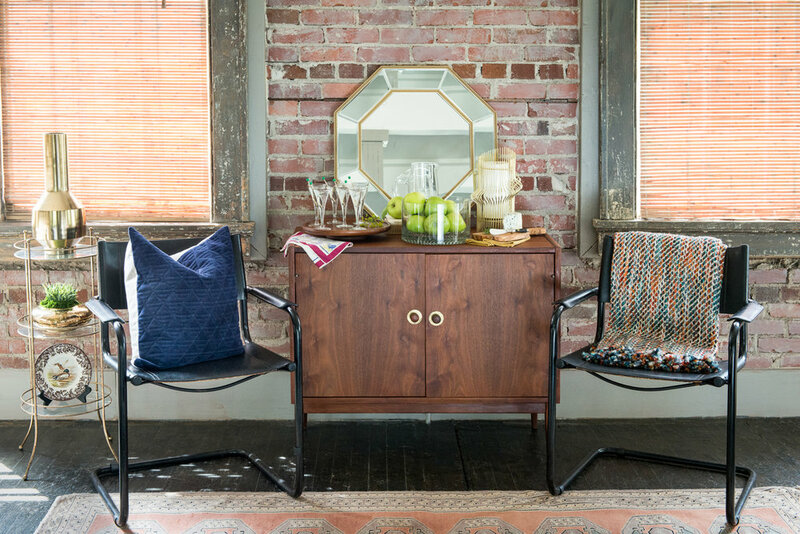 A couple of vintage metal frame accent chairs add chic to a room, and also provide easy-to-move seating when needed. Other mid-century touches can lend not only a clean and functional element to interiors, but also a sophisticated vibe. Geometric shaped vases and accessories, woven throws, textural pillows and sculptural-looking plants can help to inject a fun and streamlined vibe. Incorporating abstract paintings, (which happen to be very popular and accessible at the moment), with texture such as drips or palette-knife work help to energize a space. Styling fall entertaining presentations with a selection of familiar serving items, merged with a few purchased pieces that reflect the present mood, will welcome guests with an appreciated ease. An honest tablescape of well-worn serveware and linens makes entertaining heartfelt. The punctuation brought by a few contemporary items adds interest. Natural, autumnal elements such as apples or fall herbs are inexpensive and take literally minutes to arrange, but lend glorious fall color to any tablescape. Hors d'oeuvres created from vintage cookbook recipes are thoughtful conversation-starters and the cookbooks themselves make lovely decorative elements in the kitchen. When short on time, a few cheeses placed on vintage serving pieces are a wonderful presentation. 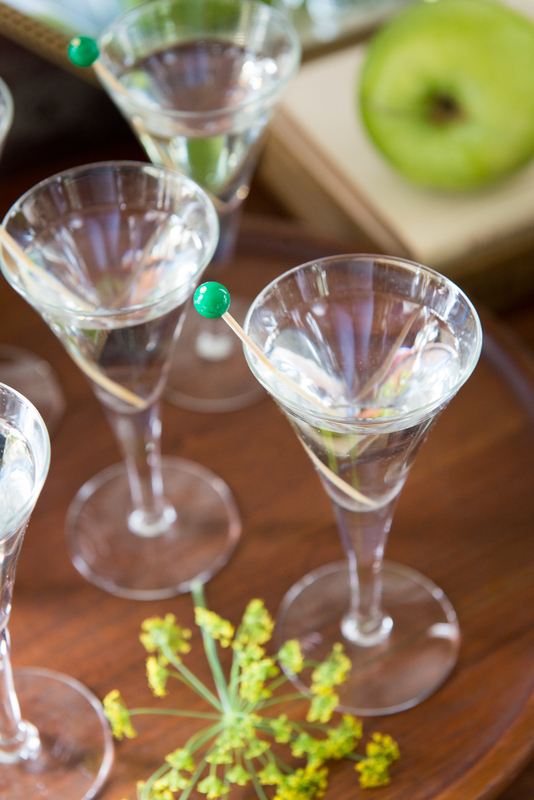 Offering a batch of martinis, served in vintage stemware such as cordial glasses, is an easy way to bring some mid-century glam to any game night or football viewing party this fall. Put function first when tweaking interior spaces for the season! A foyer or back entry can display the style of an entire home and can provide ease in everyday use. As the weather changes, a free standing coat rack can stow jackets and scarves. Locating a bench by the door to change out of wet boots is always appreciated. Reading on cool nights is even better in a comfortable chair situated fire-side. None of these furnishings need be ho-hum or predictable. Home decor retailers have created affordable and modern forms for such pieces, making it possible to have function and beauty in every corner of a home. Darker colors and richer textures drive home the exciting feeling of autumn in a room. Don’t be afraid to explore unexpected color combinations such as navy against black to get a moody feeling next to warm wood furnishings. Textured fabrics, such as a patterned bouclé, are the perfect pop against a solid background. With the luxurious feel and color saturation of upholstery fabrics such as velvets, colorful accents brought into a room through accessories and art begin to sing. A brightly glazed lamp, a mid-century ceramic piece or even a stack of vintage books looks great alongside rich textiles. With just a few new additions, an interior can reflect a refreshed ambiance, ready for the charm of fall.